I've been meaning to write about this for, well, 2 and a half years. But every time I sat down to journal/blog it out, I just couldnt. It's like a nightmare, a nightmare that changed my whole life. A nightmare that is very much real. What is common with a MS diagnosis (according to word of mouth and wikipedia), is that a person usually goes through months, years, of strange symptoms while they travel in and out of the doctors hoping for an answer. For me, it happened overnight. The day was a Wednesday, March 21, 2012. I had to be at the office at 7am for a meeting that I ran for our business department. Prior to this day I was "normal", normal being up for definition. (: I had graduated undergrad a year early to start my career, had worked as an Admissions counselor, received my MBA, and was currently the Business Development Manager of a technology company. I had moved to dc a year prior to pursue my ever dream of living in my favorite city/the nation's capital. Sputnik and I had a very cute apartment, I had the fun vintage-y sports car, I had the closet full of beautiful shoes, the batman, the friends. My career and life was blooming. I was 25 and yet I had "made it". Granted I had additional ambitions but I had achieved so much more than I thought possible by that age. I tell this portion to help paint a picture of the then vs. now. I also share because even though I have lost so much, I can look back and say "shoot, look what you did girl. You killed it". Then I woke up that Wednesday. I had a friend visiting from California and she was going to take me to work that day so she could use my car to explore. As we're getting ready I tell her worryingly that I can't really feel my legs. nbd. But shook it off because hell, I had a meeting to run. Once at work I started to realize that walking was extremely difficult. Which didn't make sense as walking should be just as easy as breathing (oh how much I have learned!). I worked through the various meetings, pushing the thoughts out of my mind, and trying not to walk anywhere. It was around 11am when I was in a meeting, training one of the new hires. I must have seemed so crazy as I stopped the meeting mid-sentence and said something to the effect of "Im sorry, can we continue this later? I need to go to the ER." My friend came and picked me up, a little confused on the happenings. She asked me to take her to the metro to go visit the city. And then I went to the hospital. I sat outside the doors for probably two hours, watching as people went in and out. For some reason I knew - it was all going to change. Of course I denied it. I kept telling those worried (i.e. parents, friends, batman) that it was just an infection, I'd get some anti-biotics and then I'd be fine! I stumbled (by this time my legs were gone) in to the ER. Just a few days prior I was walking around like no big thing, in heels, strutting. And now I couldnt. It was my first real hospital visit (had I mentioned, besides two stitches accidents as a child, I had no physical problems in life?). I explained what was going on and with immediate turn around they had me hooked up, taking blood, etc. It was a princess treatment (they were terrified for me). My nurse came in and said that they were going to admit me; to which I responded - "does this mean I get to go home soon?". She smiled, sighed, and firmly said no- it was going to be a while. Oh how naive I was. I was still thinking at this point that it was just an infection, can I have my antibiotics now? They admitted me to the heart unit because the numbness was traveling up my body at a very fast rate and they were concerned for my heart. I was sent for my first MRI of my brain, neck, and spine - a full 3 hour MRI. I remember my legs hurting so bad and not being able to "feel" them at all. The person administering the MRI kept telling me to "stop dancing" but I didn't even know I was moving my legs. It was in that first MRI that it hit me that everything was changing. I started to cry, slightly, as not to move in the claustrophobic chambers (if you've never had a MRI, pray you never have to! 21 later and I promise, they do not get easier). By the time I got back to my room, the batman was there. He had drove down from Philly and his face answered all the questions I had inside - this was serious. I called my parents and said we didn't have any answers, not to travel to dc yet, stand by, I'll hopefully have more information soon. A good friend I worked with came and visited and to help with Sputnik (the poor puppy...he had no idea!). I remember telling her some items to help with getting through work the next day, reassuring myself that I'd be back. It was 10:30pm. I was tired - we all were. It had been a long day. Batman was helping me get ready for bed (by this point I couldnt walk without any assistance) when a nurse came in with a phone. "It's the neurologist" she said as she handed it to me. "Hi this is Dr. Neurologist. I just looked over your MRI...you have 6-8 lesions on your brain, neck, and spine. We will run some more tests tomorrow but I am pretty confident in diagnosing you with multiple sclerosis. Have a good night!" Side note: you only need two lesions to be diagnosed with MS. Apparently I had had MS for a while - who knew! Don't worry - this is still a perplexing question we had yet to answer today. At first I was happy to receive this news because it was a diagnosis! The past 24 hours had been crazy and I could do MS. I had known people with - didn't look too challenging (hah). Batman and I sat up for a few hours googling things on the iPad, both re-assuring each other that this was actually good - manageable. Shows how much we knew about MS right? I should probably admit at this time that I actually had no idea how to even spell multiple sclerosis. Now I could win any spelling bee with those two words. The next day I went for a lumbar puncture (being that this was a tech savvy hospital - they had a robot helping to make the puncture. My suggestion - always go manual. Ive had three lumbar punctures done and the robot one was THE WORST by far. I ended up have a spinal headache, getting a blood patch procedure done to fix the hole, and they got blood in the samples. Don't do the robot). 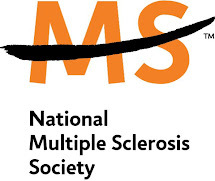 Preliminary results came back further confirming the MS diagnosis. I was lying flat (as per suggestions from the lumbar puncture - much help it did me), surrounded by my sister and the batman when the neurologist told me. I could tell in his eyes that he knew. He saw the future that I would end up having. It was a face of sadness and pity - the type doctors get when the know but don't fully express. I had no idea what he was actually thinking but that look on his face was enough to scare me. My sister went and called my parents who dropped everything to come be with me (have I mentioned how awesome my parents are?). I remember the nurses gave me something for the pain and made a joking comment to my sister "If you've ever wanted to know something from her, give this medicine 5 minutes to work and she'll be as open as a book." That was the last time I felt no pain. I spent 5 days in that room (it was a luxury suite - not as good as my princess rehab suite but pretty nice). I was given a walker to help and it was suggested to move back to Pittsburgh to heal (I lived on the third floor walk-up in dc). My last day there I remember asking the resident neurologist for a medical note for work as I'd be missing two weeks (gasp). She gave me this look that at the time I thought was judging...now I look back and realize that she knew I was never going back. Some things you go through and you think to yourself, possibly even while laughing, "goodness, it can't get worse than this." That crazy first week - I thought just that. We all did. This would be the hardest part of my MS journey. Little did I know that would be the easiest. 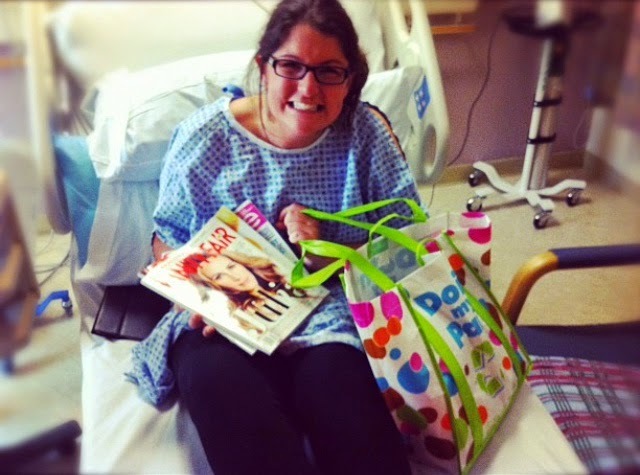 I look at this picture of me in the hospital bed during this time and that smile. My smile now looks aged 100 years by the scars, by the pain, by the issues, by this journey. No doctor has ever been able to explain to me why it happened so fast. No doctor has been able to explain why it's so aggressive, severe. Why I don't respond to medications or why I have this parkinson' thing or any of the xyzquestions that have come up in the past 2.5 years. Doctor's don't always hold the answers. It still seems like a dream some days. I wake up in the morning and those first 5 seconds of morning glory, I forget everything. And then I remember. And while I want to keep defining it as a nightmare, I know I have to accept it as life. And this crazy sparkled life is beautiful. It really is. The whole event so far has taught me a lot about life. It's taught me how to be a better person, how to suffer, how to love, how to hope. And it's a living witness that everything can change in a blink of an eye. One day you're fine and then next you can't walk. A weekend prior I had gone and played laser tag with my brothers - now walking up a flight of stairs is war. And guess what - I'm still ok fine sparkling. The most moving point of the experience was the few hours I spent in my car in the ER parking lot. It's like I was delaying it - I thought that maybe if I just sat there, all would go away. I was scared. And as I sat there, shrugging my shoulders and praying, I felt a calm come over me. A calm that can only be defined as something spiritual. A calm that helped me find the courage to stumble inside. A calm that held my hand during the lowest of lows and has celebrated in the highs. A calm that hasn't left my side at all during this adventure, this journey. Sometimes I think of this moment in the third person. I watch myself as I shake it off, climb out of my little bmw, and start the stumbling walk in to the ER. And I hear a whisper..."it was then that I carried you". So while so much as changed since that moment, nothing has really changed. God provides the calm during the storm. And when it all becomes too unbearable, He carries you. What I'm Learning about Friendship. Part 1.